All waves can be defined by two related properties: their wavelength and frequency. Wavelength is the distance between two adjacent (next to each other) and identical parts of the wave, such as between two wave crests (peaks). Frequency is the number of wave crests that pass a given point per second. For reference, the wavelength of visible light is about 400 to 700 nanometers (billionths of a meter), and its frequency is about 4.3 to 7.5 × 10 14 hertz (cycles per second). The wavelength of sound waves is about 0.017 to 17 meters, and their frequency is about 20 to 20,000 hertz. In sound, the Doppler effect is observed as a difference in the pitch of a sound. In light, differences in frequency appear as differences in color. For example, red light has a frequency of about 5 × 10 14 hertz; green light, a frequency of about 6 × 10 14 hertz; and blue light, a frequency of about 7 × 10 14 hertz. I enjoy the web site it help me with my project in Phsycial Science. Thanks alot. Clearest explanation of Doppler in a way I can understand I've read for a long time. Thank you! I am writing a book for a major publisher and am referring to the Doppler effect. 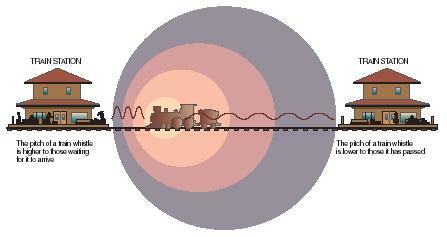 I have searched for an existing artwork of the famed Doppler train illustration. I have tried to locate the Gale Group to seek their permission to use this artwork (hopefully at print resolution). Can you help me find this group? this website help me with a project that was due the next day, thanks. Excellent explanation of Hubble! This why we make our traffic lights green instead of red!! Thats gret!the dobbler explanation came out clear which made me to understand better thanks alot. The info has really helped, and it tells a lot! really helped me with my physics project! This is the clearest explanation ever read. how this law is useable for doppler's log. how does the doppler log work. Provide me all theory of doppler log. Does it concern with the water current. What is STW. This amazing web-site helped me study for my Final Exams that are very and this is really helpful. I'm surely going to recommend this to other people that have problems with this!!! this help me a lot!!! THIS IS REALLY NICE .IT EXPLAINS THE CONCEPT VERY DEEPLY .GREAT SITE!!! I found this website verry useful. First time I'd visited this website was 2 years ago. And still I am visiting this site. I gain a lot of things about science and technology from this site. I would like to give thanks for this site.